Weather, obscure FAA regulations and bird preference have conspired to make Wheeler National Wildlife Refuge the winter home to about a dozen endangered whooping cranes this year–and maybe for their lifetime. 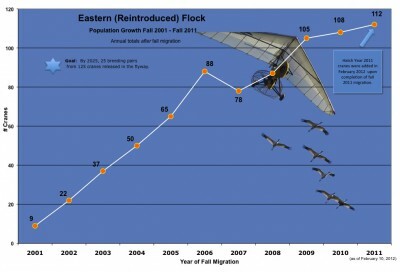 Nine whooping crane chicks–raised in Wisconsin by humans in bird costumes and led down south by an Operation Migration ultralight–ended up stopping near the refugeon January 5 to settle a dispute over FAA rules. Operation Migration got a waiver within a week, but then weather delayed the trip, a couple of the birds wanted to change direction. Eventually biologists gave up crated the birds and brought them to Wheeler, which a few other cranes had found three years ago. Since they never made it to Chassahowitzka NWR in Florida they may think of Wheeler as their winter home. Joe Duff, one of Operation Migration’s co-founders, says that he suspects they’re go back and forth between Wisconsin and Alabama, but you can never tell. Whooping cranes (Grus americana) pair off about age 3, then mate at 5, usually in the male’s territory. The class started out with 10 birds, but now has five males and four females. Another four birds, including two raised in Wisconsin and released up there to learn to fly with adult birds, were already at the refuge. Staying in Alabama throws off the plan to get the cranes to re-establish an old migration route down to Florida. “Once we get past the short-lived self pity and look objectively at the situation, we see that it doesn’t matter much that we didn’t make it all the way to Florida. The birds will still migrate north. They may need a little assistance but they will still be a part of the population,” Duff wrote on the operation’s blog. The only passengers on the Operation Migration ultralights. But, it’s not the first time the cranes have messed up human plans to help them. Some birds just decide to stop over before Florida. And this year’s warmer weather seems to have really left them uninspired to make the long trip. More migrating whoopers wintered in Indiana than Florida. Two of the birds in the class of 2011 tried to revolt against their ultralight mother. They tried to turn the group north and nipped at the ultralight when the pilot tried to retake the lead of the formation. Duff wanted to stress that the FAA wasn’t to blame for their delay or unexpected home. “They didn’t ground us, we grounded ourselves,” he said. The agency was just investigating the complaint of a former worker. In 2008 the agency started enforcing rules that ultralight pilots couldn’t be paid. After a complain last summer, the group and FAA agreed that they met the requirements because flying is a small part of the work done by the bird trainers. Plus, the rule was meant to protect the public from dodgy carnival rides; the only passengers on the ultralights are stuffed animals from Disney (a sponsor). But a new complaint from the same former worker left the FAA wondering. So, Operation Migration stopped their work until they got everything cleared up. The group got a temporary waiver and hopes to work out a permanent one. In recent years Texas and Louisiana tangled over where a new, non-migratory population would live; the birds just moved to Louisiana. But the birds themselves (along with the migration specialists) may have just made Alabama is a new site to see them.